I got a phone call the other day from a dear friend of thirty years who has been suffering with the devastating effects of a virulent form of breast cancer. She wanted to ask me about something she had read in the cancer magazine that she receives. Among the ads and informational articles about cancer treatment, was a recommendation that she include something called turmeric in her diet, and she wanted to know what it is and how she could most easily incorporate it into her eating plan. I was so happy to oblige her with information, since I think it may really help! Turmeric is that bright yellow spice that gives prepared mustard its distinctive yellow color and is used in Indian curries. It comes from the root of the Curcuma Longa plant and is sometimes called “Indian Saffron.” It is native to India and Southeast Asia, although its warm, peppery flavor is popular around the world. Note: If you are pregnant, nursing, on medication or undergoing chemotherapy, be sure to consult your doctor and pharmacist about including turmeric in your diet, especially if you are considering supplements rather than just using it to season foods as part of a healthy diet. Inflammation is your body’s response to cellular injury that, if prolonged, can lead to diseases such as breast cancer. 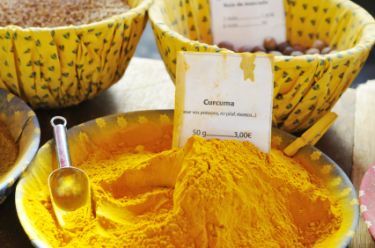 The pigment in turmeric, which is called “curcumin,” has been shown to be an effective anti-inflammatory—and without the side effects of many drugs that are sold for this purpose. The curcumin in turmeric has anti-oxidant capabilities, which helps protect your body against the cell damage caused by free radicals. The bright yellow color of turmeric is a clue to its anti-oxidant properties, since the bright pigments in foods seem to have this protective power. According to a recent study , curcumin--especially when combined with piperine from black pepper--may help fight cancer stem cells. Due to its anti-inflammatory, anti-oxidant and detoxing properties, the curcumin found in turmeric may help protect you against cancer. There is also evidence that curcumin helps the body to destroy cancer cells and thus may inhibit the growth of tumors. Studies have been done that demonstrate that those who consume turmeric regularly have a lower incidence of breast, prostate, colon and lung cancer. 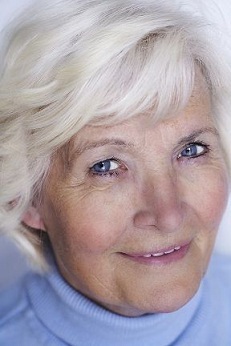 As our population ages, there is increasing concern about the prevalence of mental disease such as Alzheimer’s. A number of studies have been done which show that several active ingredients in turmeric may affect your body’s ability to ward off Alzheimer’s disease, including boosting your immune system, affecting gene coding and improving brain chemistry. Interestingly, the incidence of this devastating condition is very low amongst the old people of India, and it may be due, at least in part, to their daily consumption of turmeric in the curried foods that are popular in Indian cuisine. The curcumin found in turmeric has been shown to help your body to eliminate bad cholesterol (LDL) as well as helping to prevent the oxidation of cholesterol. This protects your blood vessels from damage and helps to prevent the build up of plaque in your arteries. This is significant in reducing your risk of heart disease and other cardiovascular disorders. A recent study suggested that turmeric may even have a role to play in weight control! Apparently, the curcumin found in turmeric helps to slow the formation of body fat, even when a significant amount of fat is consumed in the diet. Although, I am not recommending a new “Turmeric Weight Loss Plan,” including turmeric in your diet can only help, especially when you consider all of its other benefits. You can make tea from turmeric by simmering a teaspoon of the powder in about four cups of boiling water for about 10 minutes. Strain the tea and sweeten, if desired. (There are also commercial turmeric teas available, if you prefer.) Some ginger root or a ginger tea bag may be added for additional benefits and flavor. -Add turmeric to egg salad, deviled eggs, potato salad and macaroni salads. -Add turmeric to soups, chili, meatloaf, or Sloppy Joes. We love tomato soup at our house--both homemade and a good organic brand from the can. We each add turmeric according to our own taste along with some freshly ground pepper which contains piperine to complement the turmeric. Mmm-mmm good! -Turmeric is a good seasoning for steamed cauliflower with a bit of oil and salt. Can I take it as a supplement? My friend with breast cancer wondered if she could take turmeric as a supplement. Of course that is a possibility--especially if it is a whole food supplement--but with all the pills she is already taking, why add one more, when there are so many ways to incorporate turmeric into her diet? I would also be leery of taking a “curcumin” supplement, since the whole food may be necessary to get all of the wonderful benefits. Although I am thrilled that my friend with breast cancer is adding turmeric to her regimen, I am not suggesting that turmeric is a cure for cancer. However, every little thing she can do to help her body fight breast cancer, is a step towards beating it. In the case of turmeric, she will get to enjoy the warm flavor along with the numerous benefits. 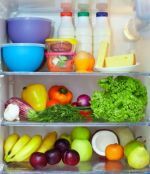 You may want to check out Dr. Weil's Anti-Inflammatory Diet, which helps to fight inflammation in your body. Whether or not you are fighting breast cancer, I hope you will consider adding some turmeric to your diet. However, please don't overdo since too much of anything--even a good thing--can be harmful. Click here to go from Breast Cancer and Turmeric to Spices and Herbs page.